Living with dementia can be an upsetting and often lonely experience, so when someone with dementia needs to stay in hospital, unfamiliar surroundings, isolation, and new faces can all add to a person’s anxiety. But what of that person’s carer or relatives? How often do we stop to think about the impact on them, or the role they might play in their loved one’s recovery? 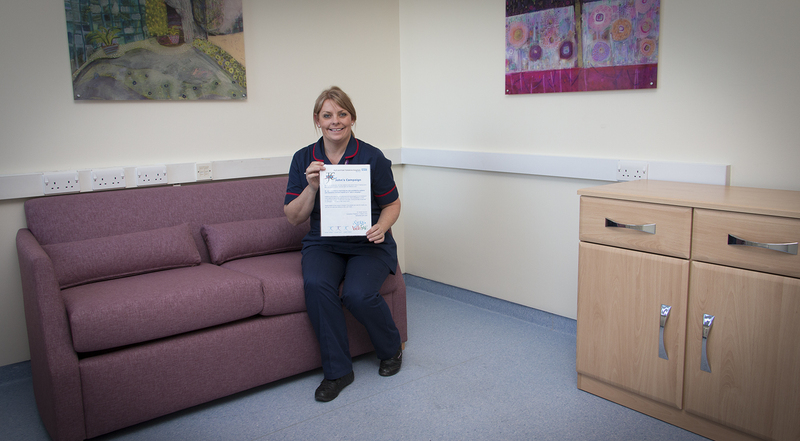 In an attempt to improve the experience of patients with dementia and their carers, Hull University Teaching Hospitals NHS Trust is piloting new overnight facilities specifically for carers on medical elderly wards 8 and 80 at Hull Royal Infirmary. The facilities The move follows local research carried out amongst carers of people with dementia which showed overwhelming support for extended or overnight facilities. It also supports John’s Campaign, a growing national movement based on the experience of Dr John Gerrard who died in hospital with Alzheimer’s in 2014 and whose family believes his decline was due in part to limited contact with loved ones. John’s campaign calls for the families and carers of people with dementia to have the same rights as the parents of sick children, and be allowed to remain with them in hospital for as many hours as they are needed, and as they are able to give. “Our elderly care wards have been operating extended visiting hours up to 10pm for some time, as we know having a loved one around can be really beneficial for people with dementia when they’re somewhere unfamiliar. Having a carer or family member there to keep them occupied, encourage them to eat or have a drink or just generally spend time with them is such a boost mentally, and helps patients to retain more of a sense of normality. “More recently, we spoke to a number of carers to ask whether, given the opportunity, they would like to be able to stay overnight with their loved one, and almost three quarters said yes. “Clearly, with Hull Royal Infirmary being a tower block, we are somewhat restricted in terms of space so, in the initial stages of rolling out John’s Campaign, we have created an overnight room which can accommodate up to two people and which has separate bathroom facilities to enable family to stay close to a loved one whilst they’re in hospital. The creation of overnight facilities in support of John’s Campaign is just one example of the work being carried out at Hull University Teaching Hospitals NHS Trust to improve the experience of people with dementia when accessing hospital services. Other pieces of work, including improved signage, recreational activities, and a special ‘memory café’ recently earned the dementia team a place in the finals of the Hull Daily Mail Health & Care Awards ‘Mental Health & Well-being’ category. Dr John Gerrard was diagnosed with Alzheimer’s in his mid-seventies. It was a slow decline with accelerations when he was ill or upset. At the beginning of February 2014, aged 86, he went into hospital because he had infected leg ulcers which weren’t responding to antibiotics. He was there for five weeks. John Gerrard went into hospital strong, mobile, smiling, able to tell stories about his past, to work in his garden and help with things round the house. He was able to feed himself, to go the lavatory, to keep clean, to have a good kind of daily life. He came out skeletal, incontinent, immobile, incoherent. He required 24-hour care and barely knew those around him. He wore a nappy, could not stand up or walk, could not lift a mug to his mouth or put words into a sentence. His family feel certain that if he had not lain for five weeks without people he knew to tend and comfort him, he would not have descended into such a state of incapacity. The individual nurses and doctors were kind, conscientious, respectful, but they couldn’t sit and talk to him, read to him, make sure he ate, keep him attached to the world. John Gerrard died in November 2014.